← I played a REALLY short game. For some reason, I’ve had Genesis stuck in my head, and kind of an odd song choice at that. 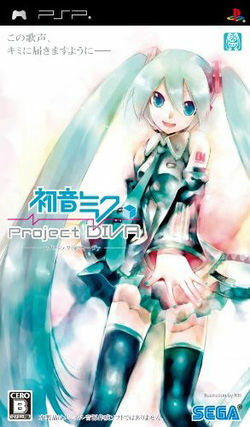 I don’t think it was a single and I don’t ever remember hearing it on the radio, but for some reason it seems to “go” with Hatsune Miku: Project Diva. Miku is certainly not the first attempt at a virtual idol, but – with all due respect to Sharon, Ulala, and Kyoko – she’s the first to really make an impact. Even though I really didn’t know what the hell I was looking at the first time I saw her waving a scallion around, it was something that got stuck in my head, and the heads of, well, an awful lot of people who are an awful lot more creative than I could ever hope to be. Since then, she’s become something of a collective mascot for the nicovideo hordes and spawned a staggering array of merchandise, both professional and fan-produced, including a series of PSP games that I am now going to get around to talking about, honest. Project Diva came out nearly a year and a half ago, but I wasn’t feeling rich enough to import a copy and I figured that I could wait for it to come out under the “Best” label for cheap. Co-incidentally, that “Best” label release just happened to coincide with my study abroad session in Japan this last summer. Not that I could find a copy, mind you. It was released and immediately sold-out, so I wound up buying a used copy of the original release for slightly more than the “Best” label would have cost me. And of course I then waited five months to play it. And it’s bloody brilliant. It may even challenge “Osu! Tatakae! Ouendan” for my Favorite Rhythm Game Ever, though possibly just because Miku is insufferably cuter than the Ouendan boys. Like most rhythm games, the game mechanic consists of pushing buttons in time with markers on the screen, with you being judged on your precision and on building up massive combo chains of concurrently-hit notes. There’s not much new there. Unlike most rhythm games, each and every song has a music video running behind it, with Miku as the star naturally enough. One of the more unique ones below, with no gameplay covering it. Oh, and there’s a sequel out too. As mentioned, I’m awfully cheap so I’ll probably get around to buying it in a year or so.